Three of North America's biomes converge in Minnesota: prairie grasslands in the southwestern and western parts of the state, the Big Woods deciduous forest of the southeast, and the northern boreal forest. The northern coniferous forests are a vast wilderness of pine and spruce trees mixed with patchy stands of birch and poplar. Much of Minnesota's northern forest has been logged, leaving only a few patches of old growth forest today in areas such as in the Chippewa National Forest and the Superior National Forest where the Boundary Waters Canoe Area Wilderness has some 400,000 acres (1,600 km2) of unlogged land. Although logging continues, regrowth keeps about one third of the state forested. While loss of habitat has affected native animals such as the pine marten, elk, and bison,  whitetail deer and bobcat thrive. The state has the nation's largest population of timber wolves outside Alaska,  and supports healthy populations of black bear and moose. Located on the Mississippi Flyway, Minnesota hosts migratory waterfowl such as geese and ducks, and game birds such as grouse, pheasants, and turkeys. It is home to birds of prey including the bald eagle, red-tailed hawk, and snowy owl. The lakes teem with sport fish such as walleye, bass, muskellunge, and northern pike, and streams in the southeast are populated by brook, brown, and rainbow trout. Minnesota is home to a variety of wilderness, park, and other open spaces. Minnesota's first state park, Itasca State Park, was established in 1891, and is the source of the Mississippi River. Today Minnesota has 72 state parks and recreation areas, 58 state forests covering about four million acres (16,000 km²), and numerous state wildlife preserves, all managed by the Minnesota Department of Natural Resources. There are 5.5 million acres (22,000 km²) in the Chippewa and Superior National Forests. 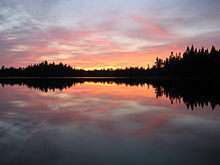 The Superior National Forest in the northeast contains the Boundary Waters Canoe Area Wilderness, which encompasses over a million acres (4,000 km²) and a thousand lakes. To its west is Voyageurs National Park, the state's only national park. The US state of Minnesota can be divided into regions in a variety of ways. On a basic level, the state is divided between the Minneapolis-Saint Paul or Twin Cities metropolitan area (often referred to locally as The Cities), and Outstate or Greater Minnesota. The Minneapolis-St. Paul metropolitan area comprises eleven Minnesota counties centered around Minneapolis, the state's largest city, and adjoining Saint Paul, the capital; plus two Wisconsin counties. About three out of every five residents of the state live in this conurbation. Greater Minnesota is less urbanized than the Twin Cities. It is also geographically more diverse, with farmlands to the south and west, lake country in central Minnesota, and forests in the northern part of the state. Approximately 40% of Minnesotans live in Greater Minnesota. Its major population centers include Duluth, Rochester, Moorhead, St. Cloud, Mankato, and Winona. Politically, Minnesota contains eight congressional districts. Climatologically, the state varies considerably from the far north, near Canada and Lake Superior to the south, where fertile farm land borders Iowa, South Dakota, and Wisconsin. Demographically, population density varies from less than 4 persons per square mile in the least developed areas to nearly 7,000 persons per square mile in Minneapolis. Geologically, variations exist due to ice cover during the last Ice Age. Culturally and economically, areas of the state vary with respect to industry, predominate professions, and urbanization. The Arrowhead Region is the northeastern part of Minnesota. It includes two of the three iron ranges in Minnesota. Collectively the Mesabi and Vermillion iron ranges are called the Iron Range and colloquially as "the Range." These parts of the Arrowhead are dotted with iron mines. The Arrowhead region also includes the North Shore and the Boundary Waters. Although no legal boundaries of the region exist, most definitions of what makes up Central Minnesota would include the parts of the state within the economic influence of St. Cloud and Brainerd. The Northwest Angle is that land of Minnesota north of the 49th parallel latitude line. Southeastern Minnesota includes the scenic Mississippi Valley to the Whitewater River and Root River in the Coulee Region, also known as the Driftless Area. Southwestern Minnesota includes the Buffalo Ridge, which is the eastern portion of the Coteau des Prairies, a geological formation characterized by higher elevation and high average wind speed, providing opportunities for commercially viable wind power. The area also includes the Pipestone Region. The Minnesota River Valley follows the state's namesake, a fertile agricultural area, running from the South Dakota border to its junction with the Mississippi River in St. Paul. "Northern Minnesota" is a broader title that includes several regions, including the North Woods, and can be defined as any area within the 218 telephone area code. The Red River Valley is a term the U.S. government uses to generally describe the sections of northeastern North Dakota and northwestern Minnesota to which the U.S. secured title following the Anglo-American Convention of 1818. Popularly, it is used to refer to most of the territory in the northwestern part of the state. Specifically, the area in the Fargo-Grand Forks media market is called the Red River Valley by media outlets (referring to both the Dakota and Minnesota parts). "South Central Minnesota" refers to a group of fewer than a dozen counties loosely centered on the city of Mankato. The Twin Cities Metropolitan area includes 13 counties, two of which are in Wisconsin. It is a socio-economic area driven by the twin cities of Minneapolis and the state capital, Saint Paul. ^ "Land and Water Area of States, 2000". Information Please. 2006. Retrieved November 22, 2006. ^ a b c d e f g Ojakangas, Richard W.; Charles L. Matsch (1982). Minnesota's Geology. Illus. Dan Breedy. Minneapolis, Minnesota: University of Minnesota Press. ISBN 0-8166-0953-5. ^ "Geologic Time: Age of the Earth". United States Geological Survey. October 9, 1997. Retrieved March 27, 2007. ^ a b Breining, Greg (December 2005). Compass American Guides: Minnesota, 3rd Edition (3rd ed.). Compass American Guides. ISBN 1-4000-1484-0. ^ "Natural history – Minnesota's geology". Minnesota DNR. Archived from the original on October 10, 2006. Retrieved October 17, 2006. ^ "Table Showing Minnesota Earthquakes". University of Minnesota, Morris. Archived from the original on March 27, 2008. Retrieved 2006-11-26. ^ "Minnesota Map Collection – State, City, Road, County, River, Lake". geology.com. Retrieved November 26, 2006. ^ "Continental Divides in North Dakota and North America". National Atlas. Archived from the original on May 13, 2008. Retrieved November 26, 2006. ^ a b c d "Lakes, rivers & wetlands". MN Facts. Minnesota DNR. 2003. Retrieved September 16, 2006. ^ "Biomes of Minnesota". Minnesota Department of Natural Resources. Retrieved November 13, 2006. ^ "Comprehensive Report Species – Canis lupus". Retrieved May 7, 2007. ^ "Minnesota climate extremes". University of Minnesota. Archived from the original on October 5, 2006. Retrieved 2006-11-10. ^ a b c "Climate of Minnesota" (PDF). National Weather Service Forecast Office. Archived from the original (PDF) on September 29, 2006. Retrieved November 5, 2006. ^ "103 Years of Twin Cities Dew Point Temperature Records: 1902–2005". Minnesota Climatology Office. March 7, 2006. Archived from the original on May 26, 2007. Retrieved April 9, 2007. ^ "Itasca State Park". Minnesota Department of Natural Resources. Retrieved November 13, 2006. ^ "Southern Minnesota". Explore Minnesota: Where to Go. Explore Minnesota- Minnesota State Department of Tourism. Retrieved June 8, 2018.